Hi, I’m Gavin Elliott, Head of Interaction Design at DWP Digital. I’m organising Newcastle’s first Geek Mental Help Week event. It will take place at the Mining Institute in Newcastle on 3 October. "We don’t talk about mental health"
Mental health is still a taboo subject in the digital sector. It’s often thought that because we ‘work behind computers’ that our jobs are not stressful. But I’m passionate about breaking down the taboo; mental health affects everyone from all walks of life. No one is immune. Geek Mental Help Week is a week-long series of articles, podcasts and events about mental health issues in the tech industry. 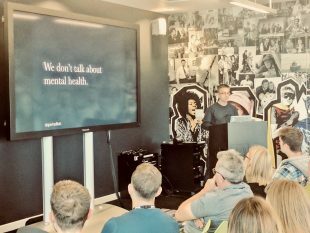 Originally set up by a group of UK-based tech professionals, the events have grown over the last few years and are designed to encourage people to start talking about mental health. At our Newcastle event we’ll hear stories from those who suffer as well as those who care for us – and we’ll find out how to help. Geek Mental Help Week gives people a voice. More importantly it starts the open communication the topic needs. Over the past couple of months I’ve been touring the UK giving a talk on Impostor Syndrome for that very reason. And from talking to the people I’ve met along the way, it’s clearly a real struggle for many people working in the sector. In DWP we have lots of great policies in place to help people who are dealing with mental health issues, and provide people with the support they need to cope. I’m proud to work for an organisation that promotes mental health awareness, and I want to encourage others to do the same. The event is being supported by Colin Oakley, a Front-end Developer at DWP Digital in Newcastle who co-organises Frontend NE. I’ll be hosting the event and have invited a few people to speak including Craig Abbott, Interaction Designer at DWP Digital; Kelly Lothbrook-Smith, Senior UX Researcher at BBC; Tom Walker, Design Researcher at BBC and a representative from North East Counselling Services. The more we talk about mental health, the more we can break down the stigma that surrounds it, so I’m really excited about getting these conversations started at the event. If you’d like to add your voice to the conversation or simply listen to what others have to say, why not register for a place? If you have any questions about the event, leave a comment below or tweet me @gavinelliott.